What Is This Product Made Of ? What’s the Benefit of The Coconut Oil In This Mask? How Will My Hair Feel From Using This Mask? What Are The Drawbacks To This Mask? What Is The Main Ingredient In This Spray? What are the main ingredients ? How to Use This Product! What Do Users Say About This Treatment? 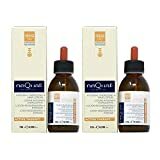 If you are looking for a lightweight, effective hair lotion that helps fix your hair loss, give the Alter Ego Nequal Intensive Energizing Lotion a try. This lotion uses a unique blend of active ingredients to help treat and prevent hair loss and improve hair condition. Hair lotions are amazing for adding a light product to the hair. They can protect against heat styling, remove flyaways and give a great sheen to the hair. This is an intense, regenerating hair lotion meant for extremely damaged and dry hair. If you have severely chemically damaged hair from lightening or perming, dry hair from lack of moisture, or suffer from thin, brittle hair due to hair loss, this product is for you. This product is also paraben free, and will not harm you with any free radicals. It is perfect for people who are interested in using products that are natural. Coralina Officinalis extracts in this treatments formula helps to rebalance and purify the scalp. This is especially useful if you have an unhealthy scalp that can be clogged with sebum and fungus. These proteins help to intensely nourish the hair bulb and hair cuticle, working to reactivate the microcirculation of the and increase the oxygen intake to each hair shaft. The regenerating properties of this product can help users who are suffering from alopecia. Many people claim that they can see new hair growing in areas that were once greatly affected from the dreaded alopecia areata. Women who like to wear their hair in tight ponytails and suffer hair loss from that, also may enjoy the benefits from this product. Many users claim that their hair loss has diminished, or even stopped from using this product. People who once saw clumps of hair in their brush each time they combed, or had shower drains full of hair suffer no more. This product’s unique formula can help even the most dreadful of hair loss situations. People who constantly lighten their hair, may suffer breakage as a result. Using this product before and after colouring can help prevent any hair from breaking during the lightening process. It can help keep your hair healthier so you are able to change the color of your hair more frequently without suffering any of the damage. Simply rub this product onto your scalp with a gentle massaging motion. This will help to stimulate your scalp, increasing general hair growth. It is most effective on clean, wet hair, and can be used every time you wash your hair. No longer suffer from dry, damaged hair! Users of this product claim their hair feels more nourished and healthy than ever before! People who use this incredible product from Alter Ego are making claims that their hair is shiny and glossy when it was previously dull and damaged. With increased usage of this hot oil mask users are making claims of their hair being more tangle free, and is more easy to comb and brush out! When hair is easier detangle, less hair breakage occurs when combing out. Less hair breakage equals overall healthier hair! Users with extremely damaged hair from chemical straightening, bleaching, perming and the use of excessive heat, are loving the benefits from this mask! This mask from Alter Ego penetrates the the cuticle of the hair, providing moisture and repairing hair from the inside out. Copper peptides occur naturally in the human body and are proteins, made of chains of amino acids. Copper peptides stimulate skin repair and increase the amount of fat cells in the scalp, that then strengthens and increases the size of hair follicles. This is especially important in people in people who are suffering from hair loss, or partial balding. Wheat can add an emollient to any hair care product. This helps prevent dry hair, hair splitting, frizziness and static. Wheat and wheat oil is an amazing way to repair any damage in hair that is damaged. Hair is created out of strictly vitamins and minerals. Damaged hair lacks these crucial building blocks. You need a product that is full of vitamins to make your hair feel healthier and look better! This product is best used on wet hair and left for fifteen minutes, to fully moisturize the hair. Apply the treatment all over the scalp, and rinse it out as necessary. It is not needed to use a conditioner on the days you use the treatment. One of the only downsides of this treatment is that it takes a long time to make the hair feel soft. You have to let the hair mask sit on your scalp for at least fifteen minutes for it to be effective, any less time and the mask will not be effective at all. It seems like any magazine you open today there is another celebrity endorsing anything containing coconut ! This magic superfruit is beneficial to eat, drink, use as a skin and body care and even for your hair! 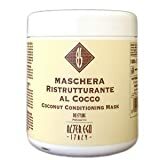 The Alter Ego Maschera Ristrutturante Al Cocco Coconut Conditioning Mask is an amazing mask for any hair type. The Coconut oil in this mask penetrates hair more deeply and faster than other competitor’s conditioners. This is because it is comprised mainly of smaller medium-chain fatty acids. Women with long, curly hair no longer suffer with running a comb through their locks. Because this mask is all natural, there is no residue left on your hair as long as you rinse thoroughly. The excessive chemicals in other hair products can lead to scalp irritation such as flaky scalp and and dandruff. The hydrating oils in this mask can sooth an itchy scalp. The extra hydration in this coconut oil mask nourishes your hair to grow faster and thicker. It can also limit breakage which makes your hair feel like it is growing even stronger. Coconut oil heals your hair from the inside out, helping to repair your hair from any long term chemical damage. Users claim to feel a large difference when switching to a natural product such as the Alter Ego Maschera Ristrutturante Al Cocco Coconut Conditioning Mask. Natural products are so much healthier for the hair than traditional styling aids, you too will feel a difference when you make the switch ! Users claim that dry, damaged hair feels soft and moisturized once you make the switch to this mask. Hair that lacks moisture looks dull and limp, and can lack shine. Dry hair can also lead to extra breakage and slow growth. Once you add moisture to your hair with this mask from Alter Ego you can enjoy the ease of styling once again! Banish flyaways and static today! While this is a high performance, amazing, product for anyone suffering from dry and damaged hair some users did find that there is too much hydration for them in this mask. This mask is better suited to people who are suffering extreme dryness and chemical damage, versus moderate damage. It is important to thoroughly rinse this product from your hair to ensure that this no residue left over. The unique blends of specialized ingredients create a stronger hair for women of color. No longer suffer from hair breaking off, you will have a stronger, thicker hair shaft with continued usage of this product. Scalp health is directly correlated to the health of the hair. People who suffer with a scalp that is covered in clogged pores or has a strong fungus, will also suffer from unhealthy hair or even hair loss. A treatment such as this one will help make the scalp a healthier environment for the user. With a healthy scalp, you can literally stop hair loss in it’s tracks , and simultaneously improve the condition of the hair. Users have made claims that their hair feels thicker and more luxurious since beginning use of this lotion. The blend of active ingredients plumps each individual hair shaft for the most healthy and naturally thick hair possible. The active ingredients in this product give amazing results for any user. A seaweed that can be used in any haircare product to strengthen the hair from the inside out. Provides a glossy sheen on any type of hair, this ingredient is especially useful on woman with ethnic hair, or women with very dry, coarse and unmanageable hair. Wash and condition your hair as you normally would, when your hair is damp liberally apply this product to the hair and scalp. For best results gently massage the scalp to increase hair growth and add scalp stimulation. It is not really possible to over apply this product, however it is not recommended to apply it in excess. Once you have applied this treatment, you can then style your hair as you normally would. Regular users of this treatment also claim that they felt their hair was in better condition than usual if they left their hair to air dry. This is due to the intense moisturizing properties of this product. Have you ever wanted to add instant shine and gloss to your hair ? 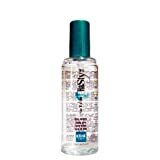 Now you can add an instant healthy look to your hair, even when it is slightly dry and damaged with the Alter Ego Hasty Rise N Shine Shining Spray. This is a shine spray that restores an extraordinary gloss to all natural hair types, without leaving a sticky film, or damaging buildup. This product adds moisture back into hair that is dry and lackluster. Dry hair can lead to breakage and will not look appealing or shiny. Users claim their hair felt better than ever before once they began using this product from alter ego. Many women know the difficulty of needing your hair to look perfect for an event or party. Now, you can instantly add gloss to your hair with this spray! It makes the hair look healthy and glossy, even when it’s not. Many users state that they love this product for a night out, as it makes their hair look silky smooth. Women who use this product have even said that it looks like they came right from the salon ! If you happen to use too much of this spray, it can make your hair look greasy. Make sure that you are not over using this product, and only use it a few times a week for best results. Women of colour who wrap their hair overnight love to spray this serum in their hair before they go to sleep, they then wake up with beautiful, shiny hair in the morning! This product is also incredibly hydrating, making it perfect for women with coarse, frizzy afro hair. Women of color also can suffer from extreme breakage from braiding, hair locs, dreadlocks, weaves and extensions. This product is great at smoothing down dreaded flyaways and healing dramatic breakage and hair loss. One of the main active ingredients in this spray is hemp seed oil. This particular type of oil has amazing benefits for the hair and is added to many all natural hair products. One of the main benefits of hemp oil is that it moisturizes the hair and scalp. Hemp oil works to prevent water loss of the hair and literally injects moisture into both the hair and scalp. Hemp oil also enhances the growth of hair though omega 3, omega 6, and omega 9 essential fatty acids. Hemp oil also maintains the natural hair texture and makes the scalp livelier to support natural hair growth. If you are suffer from thin, weak, brittle hair this product is great for giving your hair extra life and body! This treatment is from Alter Ego, and it is extremely lightweight yet very effective. It nourishes the scalp and hair with natural mineral salts, rich vitamins and beautiful essential oils. You will love the invigorating menthol feel this product will give your scalp. Menthol is great for stimulating the scalp, and cleaning off any damaging buildup that may be clogging the pores on your head. Menthol is a great way for regenerating your scalp and hair helping to solve hair loss. Many users that are suffering from thin, lifeless, hair love that product seems to make their hair grow thicker, and faster than ever before. People who are suffering from dramatic hair loss, are no longer suffering with this hair treatment. Users love the smell of this hair treatment, claiming that it has very refreshing during useage. The mint and rosemary scent is unisex and can be enjoyed by people of all ages. Mint especially gives an extremely refreshing, tingly feel for users. In addition to increasing hair growth, users have also claimed that it decreases the amount of daily shedding of hair may occur. This product is less expensive than other products that perform the same way. All of Alter Ego’s products are made with extremely high quality ingredients, and are recommended by professionals. This product is most effective rubbed on the scalp after showering. We suggest using it every time you wash your hair for the most effective results.Many users feel like they do not have to wash their hair as frequently since making the switch to The Alter Ego Italy Herb-Ego Fresca Energizing Treatment. If you struggle with dangles and knots in your hair, you may want to consider if your regular daily conditioner is doing its job. If your hair often seems unhydrated, damaged, and is generally unmanageable consider purchasing a stronger daily conditioner. The Alter Ego Energizing and Rebalancing Cream is stronger than a traditional condition but will not weigh down your hair like a treatment may. This is an energizing conditioner meant to strengthen weak and brittle hair . It is to be used after shampooing, and is safe for use daily. It gives moisturized feel and stronger structure to the hair leaving your hair shiny and healthy with every use. For women with coarse, damaged hair it is recommended to use this mask every day, and to leave it for at least 15 minutes before washing it out. Many users claim that this this the most intense deep conditioner, and is capable of dramatically improving the condition of the hair. The main active ingredient in this product is garlic. Now, while this is not a traditional ingredient that you think of in haircare, it is extremely beneficial. Hair loss is something that both men and women alike suffer with, and it can be very embarrassing. The use of garlic has dated back to the egyptian times, where people used to rub garlic cloves on bald areas.Garlic does not only prevent moderate hair loss, but it also stimulates new hair growth. Diluated garlic oil does not have a bad smell as you would assume, the other perfumes that are added to the product tend to over take the scent. Many claims have been made about the moisturizing properties of this treatment, women love the way their hair feels with continued use of this mask. One woman claims that her hair has grown longer, faster than she has ever experienced before! This treatment has enabled this women to grow her hair past her shoulders in only a few months. Coarse, Afro Hair be banished! Now women of color can enjoy silky, frizz-free hair with this treatment. Although, some ladies claim this is not enough hydration for their extremely damaged and dry hair. If you feel that it is not enough for you, you may want to also add a leave in conditioner to your haircare regime.